Filet Crochet Patterns. Learn to analyze filet crochet charts. Filet Crochet Patterns. PART 1. Filet crochet patterns are not always granny's doilies on the coffee table. -:) Filet crocheting is a very universal technique. It allows you in a very simple way to create your own patterns which do not even remind those simple doilies which your grandmother adored so much. Technology of crocheting goes ahead very fast. Develop your ability to analyze filet crochet charts and you will be awarded by the chance to demonstrate the results of your creativity making the unique garments in a very simple way. Filet crocheting is really a very flexible techniques. Like none other technique, filet pattern allows you easily to change elements of the filet crochet charts, make them bigger or smaller, add three dimensional elements to them, and etc. You don't have to be a very experienced crocheter to be able to do it. Nevertheless, some basic skills in filet crocheting are necessary. To refresh you memory about this technique, check very helpful links from Filet Crochet page. Filet patterns will look great both whether you crochet fine silk or cotton thread or you are going to use thick wool yarn. That's why very many crocheters prefer namely filet crochet patterns when they consider variants for crocheting a new project. Opened and filled.... Hm, not too many variants of stitches to demonstrate your creativity.-:) Nevertheless, lets try. To crochet a typical opened mesh cell: make double crochet, chain 2, double crochet, (dc, ch2, dc). To crochet a filled mesh, substitute "chain 2" by "2 double crochet"(dc, 2dc, dc = 4 dc). 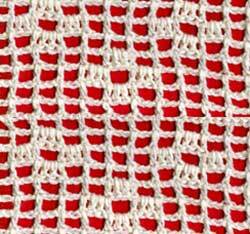 There are a few ways to create your own pattern based on the filet crocheting technique. Let's consider first of them. If you don't like to count stitches too much following complicated pattern, use small groups of repeated vertical or horizontal filled meshes, to create a crochet fabric. You can make different variants of the same pattern changing number of filled meshes and their location on the crochet fabric. Every time it will look different. 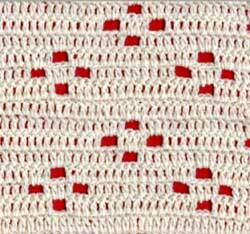 Filet crocheting is the only kind of crochet technique which have a unique feature. It allows you to make positive/negative conversion of the same pattern. Compare Pattern #1 and Pattern #2 below. Solid square is a filled mesh, clear square is an opened one. This is a typical example of a negative-positive pattern. Using the same chart where the majority of meshes are filled for the winter garments, you can easily convert it to a more lacy/opened meshes variant for a light summer dress. As I've already mentioned, filet patterns are the combinations of the opened and filled meshes. Change their rhythm or position and you have completely new, pattern like this Zig zag Patterns #2 and #3 below, for instance. Use a larger number of hook. To alter a mesh shape, crochet 3-4 horizontal chains instead of the traditional 2 chains between double crochets at the beginning and the end of each cell. Would you like to make your filet crochet pattern look special? There are many ways to do these changes. You can substitute some of the meshes by 3-D elements. Here is how: Follow to Filet Crochet Patterns. Part # 2 page. More brilliant ideas about filet technique can be found at TryCrochet site. Home › Filet Crochet › Filet Crochet Patterns. Part 1.